(1) Insta Etch 2000 wireless bluetooth 4" wide (100mm) stencil printer - Stencils up to 4"x6" large format. 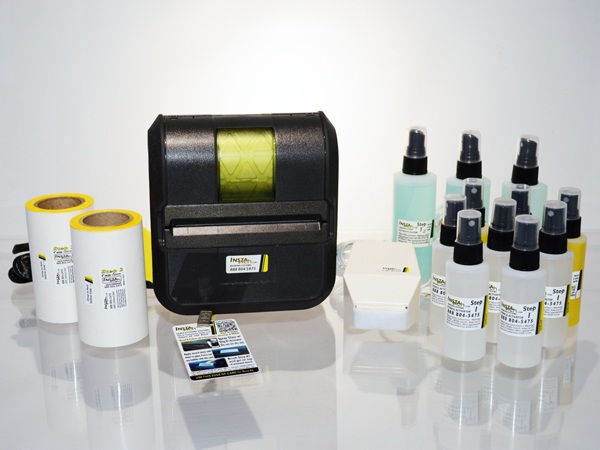 (1) MarkEtch10METAL -wired handheld marking system for permanent electrochemical surface marking & deep etching of metal. (5) Etch60spray - Step #1 stencil adhesive. (2) Etch2000roll - Step Two 4" wide 100 feet long (3048cm) each stencil roll. Each enough for 1200 larger (4" high x 2" wide) stencils or 2000+ smaller (4" high x 1.5" wide) stencils. (3) Etch120electro - Step #3 general purpose etching electrolyte. (3) Etch60neut - Step #4 neutralizer spray.